Rachel and Kirsty are on holiday at Blossom Hall … but they’re also on a special mission to help the Petal Fairies! 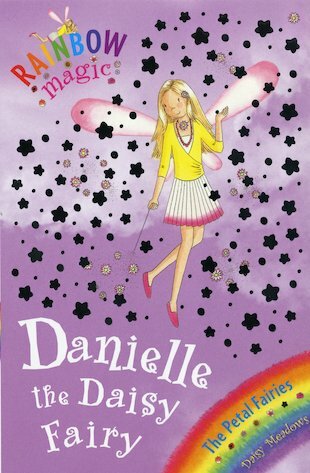 Can they find Danielle the Daisy Fairy’s magical petal before Jack Frost’s nasty goblins track it down? I really loved this book because Rebecca Wilson becomes a friend of the fairies and now I am going to make my own stories of rainbow magic series using the same fairies and series called the rainbow magic special! Dannielle is the daisy fairy.